As you probably read in the first installment, Mark's Duck House, of my newly launched series, "DC Eats and Food: My Lunches with Jeanne," she might or might not be a figment of my imagination. In this series, I cover some of my DC area favorite eats. I know most restaurants do not like to be a one-trick pony, but more often than not, we are enchanted with only one or two dishes on a restaurant's menu. We blindly order the same dish every single time like a familiar, comfy blanket to snuggle up with. Rarely do we love (almost) everything on the menu, and that is why DGS Delicatessen is such a refreshing addition to the DC food landscape. The chicken matzo ball soup, deep golden, clear broth, rivals, if not surpasses, mine, on my best days. On my worst, it's leaps and bounds ahead of mine. Did I just admit to that?! Duck fat matzo balls, oh gosh, divine. No hint of duck flavor, which is a check in my book. I don't want a hint of duck in my classic Jewish soup, but if that is the secret to these matza balls?! It did a magical number on them. They are perfectly airy and shape all intact. Visually, I love the diced al dente carrots sunken to the very bottom, seen through the translucent consommé filled soup bowl. Waiting transfixed, suspended, to be fished by the diving spoon. Jeanne, who didn't accompany me to DGS, but went there, not once, but twice, with her family, for Sunday brunch, was cooing over it. "We LOVED this place, Shulie. Thank you so much for the recommendation. The matzo ball soup and latkes were absolutely the best I've ever had, and I am as Jewish as a Chinese girl gets!!" 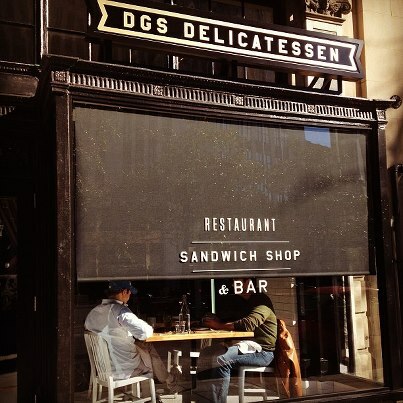 As die hard NYC's Katz's Deli fans, it was risky to take a chance on DGS' pastrami on rye. Boy did they reinvent the pastrami and put their own spin on it. As long as it is equally as good, even if different, I can live with that. I thought the atypical thicker slices would turn me off, but nothing about the way I was inhaling the peppery crusted cuts, gave any indication of that. It's a gigantic sandwich so I shared the other half with Jonathan. He ordered pastrami hash. It was brunch time. The fresh rye bread is toasted at the edges. Really brilliant flavor and texture. The next time we went, I asked for the leaner pastrami cut. Jonathan ordered the corned beef which was equally as good. The pickles aren't overpowering. Great, mild accompaniment to any of the main dishes. On that second venture out to DGS, it was dinner time. Jonathan ordered a charred Ras El Hanout cauliflower side. We both loved the smokiness from the North African, Ras El Hanout, spices, according to the waitress, mixed in house. Meanwhile, I haven't even touched the sleek exterior and casual chic interior. In all honesty, I can't wait to go back. Disclaimer: I do not get comped by restaurants or their PR agencies to write these posts. I foot the bill myself. I share only places I love. This series is snapped with my iPhone. I've never been to DC... actually, I've never been to the East and I'm positively green with envy of my 13 year old daughter who is making a Spring Break East Coast Trip with her school! So glad you are posting all of these as one day I will be visiting and following in your footsteps! If I go back to DC I will surely check this one out! I used to go every year, and is where I learned about so many ethnic cuisines. I ate pastrami sandwiches this past week, and I like the idea of adding pickles. Wish I´d seen a picture of the soup! You did?! How fun. Maybe you will re-launch your annual DC visits?! Next time I go I will Instagram the pic just for you. The place sounds like a gem! I really need to get back to DC! It's been too long. Everything sounds so good...especially that bread pudding. I wish I lived closer. I'd be there this weekend for sure! Aww Monet. TY. You would have loved it! I wish you were living closer.